We may be just on the cusp of November, but winter weather seems to be looming like a storm cloud on the horizon. The first (of what will hopefully be few) winter storm blew through the Northeast earlier this week with devastating results, reminding everyone that it may be cool, crisp and clear right now, but who knows what could happen overnight. (For the record, it's 81 in Orlando this week -- who else is booking their airfare?) Whether you're snowed in or not, those dreary winter evenings can be hard on the mind and body, so perk yourself up with a hot cup of gin! Hot cocktails date back more than 3 centuries, with headliners including the wassail (an ale-based concoction) and hot buttered rum, an all-American invention dating back to the early Colonial period. If you need to drive the chill from your bones, shake the snow off your boots or just curl up on a cold, wintry night, these cocktails will be your best friends, fuzzy socks and meditation coach all in one. 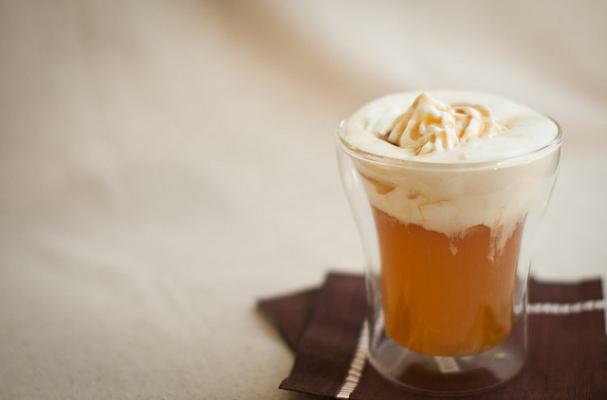 Like a hot milk punch, this version incorporates cognac, rum and maple syrup for a delicious winter punch. Rum, water, butter and spices make for a satisfying combination of sweet, spicy and delicious. This incredible gin-based punch is like the Hot Toddy's feisty younger sibling - perfect for groups large or small.